An ancient country house in the heart of Umbria, Villamena is set among the green hills halfway between Rome and Florence and just five miles from Assisi, the home of St. Francis. The name comes from a famous engraver, Francesco Villamena who lived there. (1566-1624). Built in medieval times and owned by the family for century, it has been renovated using original materials to create exclusive very well furnished apartments, some of them with fire place, all of them with well-equipped garden. 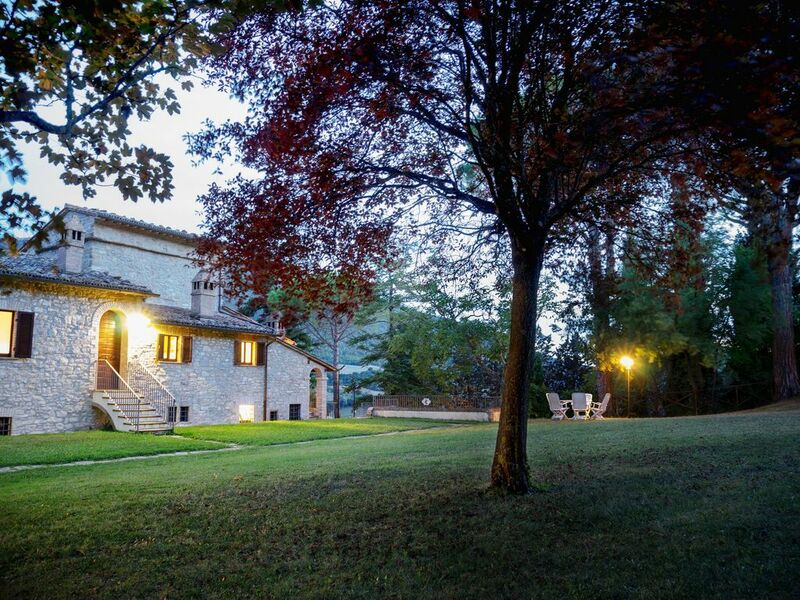 The complex not only offers the tranquillity of the unspoilt Umbrian country-side, but also provides a perfect base for combining a sightseeing holiday with walks and hiking.Villamena is located 450 metres high in the hills, and therefore has amazing views over the hills that are partly cultivated and partly forestry. The owners have prepared 25 exclusive itineraries,in three languages to share with their guests for walking directly from Villamena, or to visit other parts of Umbria such as Spello, Bevagna, Montefalco and Gubbio . Those who are interested in the Italian Language have the possibility of having individual Italian lessons taken by a qualified teacher. BBQ area. Private Tennis (hard court) free. I 've been running Villamena for twenty years. For me it' s a very unique place: quite , simple, elegant.That's my idea of what beautiful in life. Of all of my passions, I like travelling and meeting people. And I love to see people discover my part of the word with their own eyes and through their own experience. Traditional Moka and coffee avalaible in every apartment. Villamena is in the countryside five kilometres from Assisi, the name coincides with that of the famous engraver Francesco Villamena, hailing from place, nestling among the green hills of Umbria called the green heart of Italy, majestic and rural, graced by medioeval cities and mystic places. Assisi is the birthplace of St.Francis, in honour of whom the Basilica was erected with its masterpieces including the immortal Affresco by Giotto.